Though our spring break isn’t until the end of March, my kids do have the day off school today for a teacher inservice day. Having learned my lesson after the overabundance of snow days we’ve had so far this year, I knew I needed to have a project ready that would engage them and maybe even teach them a thing or two. So we decided to make oobleck! And yes, it was MESSY, but it was oh, SO much fun… Every one of my five kids, from my 6-year-old right up to my almost 12-year-old, wanted a chance to play with it. 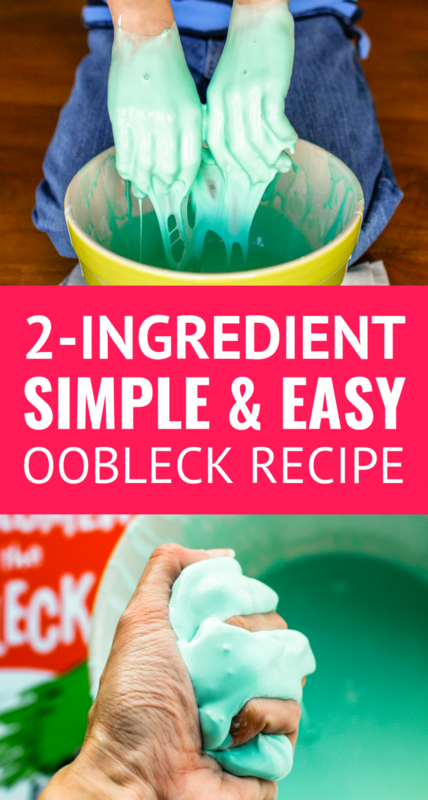 For those of you on a budget, you’ll be thrilled that this oobleck recipe is super inexpensive. In fact, you probably have everything you need for a basic oobleck mixture sitting in your pantry already! While most Dr. Seuss fans are probably familiar with oobleck, for those of you that aren’t, I’d encourage you to pick up a copy of Bartholomew and the Oobleck. As with so many of his books, this is a lighthearted, fun read, with a really great moral at the end. To give a quick overview, there’s an old king who wants something new to fall from the sky, so he calls on his royal magicians. They create “oobleck“, a green substance that rains down. The result is a sticky, gooey, gloppy green mess that covers the entire kingdom — and its residents. Along the way readers realize that just maybe we should be careful what we wish for. Thankfully, the king’s young pageboy, Bartholomew, saves the day by urging the king to say some simple magic words. If you’re going to show your kids how to make oobleck, picking up a copy of the book is an excellent complement to the project! You really only need two ingredients to make this oobleck recipe — cornstarch and water. If you want to add color, I recommend using tempera paint versus food coloring to prevent any staining. Okay, I warned you this was going to get messy… Both you and your kids will probably end up covered in goo, but it’s the best kind of mess — one that’s loads of fun, yet easy to clean up and washes out of clothes without a trace. How do you make oobleck? Well, you won’t be able to mix it easily with a spoon. You’ll have to get your hands in there and work with it until it’s the right consistency. But trust me on this, you’re going to have just as much fun as the kids! The really cool thing about oobleck is that it’s neither a liquid nor a solid. It’s actually a suspension (known as a non-Newtonian Fluid) and will behave like either, depending on the amount of pressure you apply. Squeeze it in the palm of your hand, and it will feel like a solid ball… But when you open your hand, it will flow over and between your fingers like a liquid. It’s really the most bizarre feeling — YOU’LL want to play with it for hours, too! PIN IT NOW! CLICK HERE TO ADD THIS OOBLECK RECIPE TO YOUR CRAFTS FOR KIDS BOARD ON PINTEREST! While it will take a little experimentation to get the proper consistency, a good starting place is to mix 1 1/2 cups of cornstarch with 1 cup of water. I added 3 tablespoons of green tempera paint to color the suspension, but you can use more or less or leave it out altogether. Mix the ingredients using your hands, adding more cornstarch or water as necessary. You’ll know you’ve got the right consistency when it feels similar to honey or molasses yet “tears” when you drag your fingers across the surface. You can store the oobleck in a covered container to play with again. The cornstarch and water may separate, but you just simply need to work them back together. I recommend covering your work/play area with an inexpensive plastic tablecloth to make cleanup easier! If your kids love this oobleck recipe, they’ll also adore this easy glitter slime recipe. It’s easily created with just four simple ingredients and NO borax! Package it up in a plastic container for a great DIY gift idea that will provide hours of fun. I’d love to see how your oobleck turns out… Tag me @Unsophisticook on Instagram or use the hashtag #Unsophisticook so I can check it out. Enjoy! The kids will go bananas for this! I can’t wait to see the expressions on my kids’ faces when they see this! So much fun! !